Fully furnished 2 bedroom apartment, with shared bathroom sleeping, 5 people. Spacious living area/kitchen including all modern appliances. Satellite, TV and DVD Player, huge main balcony complete with dining furniture and great pool and garden views. One of the best and biggest located complex in Calis. Swimming pool with separate kids pool and very large well-kept garden. Quiet location in under 3 mins walks to the Calis Beach. There is a lovely terrace overlooking the pool lending itself for great alfresco dining and which is lit up at night. 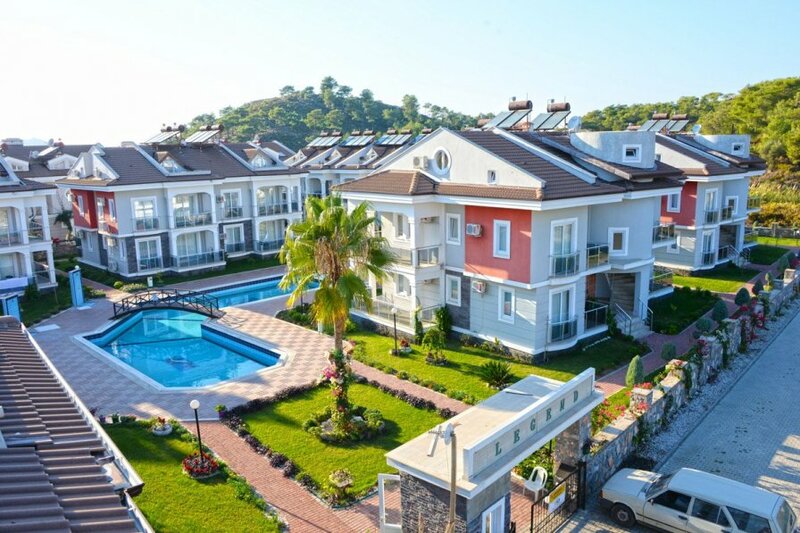 The apartment is also situated very close to the main Calis Beach Resort, which is easily reached within 5 minutes to Fethiye town within 10 minutes by bus. Just 3-minute walk to Calis Beach finds you on the main bus routes to Calis beach, Fethiye town, Hisaronu and Oludeniz/Blue Lagoon Beach. These buses (Dolmus) run every couple of minutes from early morning until late at night and are very reasonably priced and will stop anywhere to pick you up. As well as the Dolmus there is the water taxi service, which is a wonderful way to travel across the bay to and from Fethiye.